Englewood, CO, February 19, 2019 --(PR.com)-- HCA Healthcare/HealthONE’s Swedish Medical Center has announced Sean McConnell, RN, as the 2018 Employee of the 4th Quarter. The award is part of the Swedish Excellence Awards recognition program to recognize employees who uphold the hospital standards and values every day. Sean was nominated by his peers at Swedish Medical Center, a 408 bed acute care hospital located in Englewood, Colorado. “As a nurse leader on the burn unit, Sean demonstrates an innate ability to look at big picture issues and provide solutions to move towards excellence,” said Lindsay DeSantis, burn quality manager at Swedish Medical Center. Sean, a dedicated nurse at Swedish, recently worked to create an educational website for first responders and staff members looking to learn more about burn injury. Sean is also the founder of "The Burn" podcast which features a multidisciplinary team of burn experts discussing topics surrounding burn. The podcast will be presented at the national level at the American Burn Association Conference in April. Sean was celebrated at the quarterly Swedish Employee Excellence Awards in front of nurses, physicians, hospital administration, and friends. 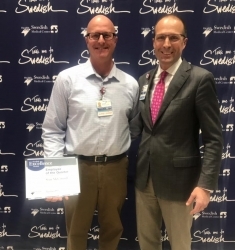 The Swedish Excellence Awards recognition program is designed to recognize employees at Swedish Medical Center who exemplify the hospital values while continuing to go above and beyond. One employee winner is selected quarterly.